Each year the Maryland State Department of Education (MSDE) surveys parents of children receiving special education services in the State. 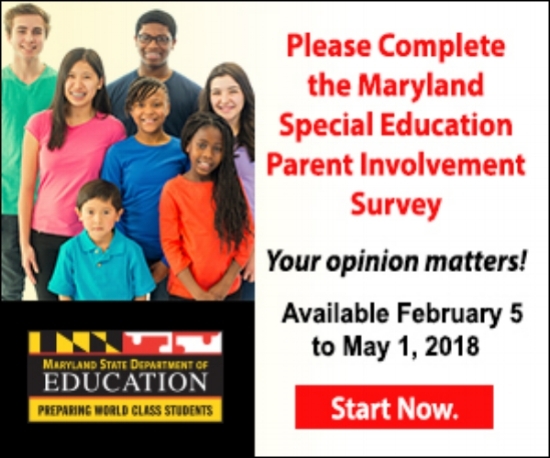 The purpose of the survey – The Maryland Special Education Parent Involvement Survey – is to hear from parents about how well they think their child’s school is partnering with them and promoting parent involvement in their child’s education. SEED MD’s Holiday Shopping Sprees! Thanks to Anquan Boldin’s Q81 Foundation and The Ed Reed Foundation, SEED students will be sent on holiday shopping sprees at two local retailers! We are looking for volunteers to serve as holiday elves to chaperone our students through the stores as they collect their gifts of choice. Thank you for your support and interest in volunteering for our holiday shopping sprees. If you are interested in volunteering with SEED in the future or have any questions, please contact our volunteer coordinator at rwaters@seedschoolmd.org. We are also accepting donations to help make this event a success. Thank you for joining us for one of our 2018 holiday shopping sprees! We look forward to getting in the holiday spirit with you. Our volunteer coordinator will be in touch with you regarding directions and any further instructions or details. If you have any questions, please contact rwaters@seedschoolmd.org. Join us at the 8th Annual Ed Reed Turkey Day! On November 16th, The Ed Reed Foundation and community volunteers will be at The SEED School of Maryland to unload, assemble and handout 400 Thanksgiving meals to every student and their family as they head home for the weekend. Every SEED student will receive a turkey and all the trimmings to make a delicious Thanksgiving meal, compliments of The Ed Reed Foundation. Please join us by volunteering your time! We have limited space for this event—all spots are first come, first served. Please fill out the form below to RSVP today! Thank you for your support and interest in volunteering for Ed Reed Turkey Day. If you are interested in volunteering with SEED in the future or have any questions, please contact our volunteer coordinator at rwaters@seedschoolmd.org. Thank you for joining us for Ed Reed Turkey Day! We look forward to sharing this annual tradition with you. Our volunteer coordinator will be in touch with you regarding directions to campus and any further instructions. If you have any questions, please contact rwaters@seedschoolmd.org. As Maryland’s only statewide, tuition-free, college-preparatory, public, boarding school, we provide our students with the tools to successfully attend and graduate from college. The SEED School of Maryland is providing our returning (and newest 6th grade) students with necessities to support their dorm life! We have limited space for this event—all spots are first come, first served. Please fill out the form below to RSVP for the event. We are grateful for any and all volunteers during this fun and meaningful day. It's that time of year again! We encourage parents to participate in the SPED Parent Survey from MSDE. Don't miss our last open house of the season--Saturday, March 10! Save the Date for Our 4th Annual Senior Dinner! Mark your calendars! The SEED School of Maryland will be hosting the 4th Annual Senior Dinner on Friday, April 20th, 2018. This year also marks the tenth year of SEED MD's dedication to transforming the lives of underserved youth in Maryland! Come join fellow supporters and the SEED Senior Class, to celebrate this milestone in our community and in the lives of SEED's fourth graduating class. This year, we will also be honoring two very special people near and dear to our hearts: Beth and Harry Lebow, who have tirelessly supported the SEED community over the past decade. We hope you will join in this celebration of lives changed and futures transformed. Please click here for more details, sponsorship opportunities, and advance tickets. The SEED School of Maryland welcomes former Baltimore Raven, Ed Reed, who will personally provide food boxes to students and their families. Former Baltimore Raven, Ed Reed, with support of the United Way of Central MD, ShopRite, private donors and public support, will once again be feeding almost 3,000 people for Thanksgiving. On the afternoon of Friday, November 17th, Ed will visit The SEED School of Maryland (SEED Maryland) to personally give Thanksgiving meals to all 400 students, to take home for their families. Earlier in the day, at 10:00 AM, Congressman Elijah E. Cummings, the U.S. Representative for Maryland’s 7th congressional district, and SEED Maryland Board of Trustees member, will join the students, faculty, families and friends to express his gratitude to the volunteers and charitable organizations supporting this effort. With the support of local businesses, the Ed Reed Foundation is committed to helping those in need via local schools and shelters who have identified particular families for these Thanksgiving blessings. The Foundation also gives food to students of Booker T. Washington Middle School & Loving Arms Youth Shelter among others. The SEED School of Maryland (SEED Maryland) is a statewide, public, college-preparatory boarding school offering an extraordinary learning and living experience in preparation for college and beyond. The Maryland General Assembly passed legislation to establish the school; which receives state, local and private funds. The Maryland State Department of Education (MSDE) oversees the school and holds it accountable to state and federal standards for teaching and learning. By design and state-law, SEED Maryland serves students who could most benefit from our 24-hour learning environment. Ed Reed “Eye of the Hurricane (“EREHF”) is operating through a fiscal sponsorship with Players Philanthropy Fund, Inc. (Federal Tax ID: 27-6601178), a charitable trust with federal tax-exempt status from the IRS as a public charity under Section 501©(3). Contributions to EREHF are tax-deductible to the fullest extent of the law. Every year, SEED Maryland's newest sixth graders share their personal aspirations during the SEED Dream Ceremony--and this year, CBS Baltimore joined the festivities. Click on the video below to check out their coverage of the ceremony. As Maryland’s only statewide, tuition-free, college-preparatory, public, boarding school, we provide our students with the tools to successfully attend and graduate from college. The SEED School of Maryland has partnered with Wegman’s, Sephora, and the Maryland Food Bank to provide our returning (and newest 6th grade) students with necessities to support their dorm life! We have limited space for this event—all spots are first come, first served. Please fill out the form below to RSVP for the event—you may choose a one hour shift or stay for the 2-hour duration. We are grateful for any and all volunteers during this fun and meaningful day. Longtime SEED supporters and Development Committee members Alicia Matthai and Beth Smith invite you to Pizza, Prosecco and Possibilities on Thursday, April 6th from 6-9pm. Stop by The Girl Next Door at the Village of Cross Keys and sip, nosh, and shop for the latest spring/summer designs…all for a great cause! Guests will also have the chance to learn more about the newly launched VOLUNTEER program at The SEED School of Maryland, the only tuition-free boarding school for under-served kids in the state. For more information contact Katie del Carmen Byram at kbyram@seedschoolmd.org or at 410-843-9477 ext. 709. Save the Date for SEED Maryland's 3rd Annual Senior Dinner! On Thursday, May 11, The SEED School of Maryland and distinguished guests will celebrate our third graduating class of seniors, the Class of 2021. Because our students’ ultimate goal is college graduation, we use that graduation year to describe our classes from the moment they enter our doors in the sixth grade. Ninety-eight percent of our graduates were accepted to a four year college or university, thanks in part to The SEED Foundation’s College Transition & Success (CTS) program—the first college success team of its kind in the nation. With their support, our SEED graduates become self-directed, self-motivated and prepared to succeed in college and life. This year’s keynote speaker is Kevin Liles—record and entertainment executive, former president of Def Jam Recordings, former executive vice president of The Island Def Jam Music Group, current president of KWL Enterprises—and longtime SEED supporter and Board of Trustees member. We hope that you will join us in this celebration of lives changed and futures brightened. For those interested in serving as an underwriter for this event, please, click here for sponsorship information. Buy your Senior Dinner ticket here! The SEED School of Maryland has partnered with the Anquan Boldin Foundation to sponsor the 5th Annual Q81 Shopping Spree. On Thursday, December 15th, 65 SEED students will receive Walmart gift cards to shop for their friends and family this holiday season. Our 65 students are chosen based on academic achievement and exemplary character representative of our Core Values. WHAT: SEED Maryland staff and community volunteers "Elves" will be at Walmart to help students shop. Anquan Boldin is a former Baltimore Raven and a current Detriot Lion who maintains close ties with the children of Baltimore City. Not only is this his Foundation’s fifth year of donating a Holiday Shopping Spree to The SEED School of Maryland’s student body, but he has also sponsored summer enrichment programs, a scholarship fund, and hosts an annual Q-Fest in his hometown of Palm Beach County, FL. In 2015, Anquan Boldin received one of the highest honors in the NFL, the Walter Payton Man of the Year Award. If you’re interested in volunteering at The 5th Annual Q81 Shopping Spree, please register below. We have a limited amount of volunteers for this event—all spots are first come, first served. Thank you all for your overwhelming support and interest in volunteering for Anquan Boldin’s Fifth Annual Shopping Spree. Unfortunately, all volunteer spots for the event have been filled. If interested in volunteering with SEED in the future, please contact our Volunteer Coordinator at gcaddell@seedschoolmd.org. For more information about the Anquan Boldin Foundation, please click here. Join Us Friday, November 18th! On November 18th, The Ed Reed Foundation and community volunteers will be at The SEED School of Maryland to unload, assemble and handout 400+ Thanksgiving meals to every student and their family as they head home for Thanksgiving vacation. Each family will receive a turkey, stuffing, vegetables, and pumpkin pie, compliments of The Ed Reed Foundation. Please volunteer for one shift! Thank you all for your overwhelming support and interest in volunteering for Ed Reed Turkey Day. Unfortunately, all volunteer spots for the event have been filled. If interested in volunteering with SEED in the future, please contact our Volunteer Coordinator at gcaddell@seedschoolmd.org. On September 22nd, a group of 6th grade students entered their classroom and were greeted by a new substitute teacher, "Mr. Garfield." We'd like to thank Bank of America, Adam Jones, Major League Baseball, and the Orioles for creating an unforgettable day for our students. Rising Senior College Boot Camp! Rising Seniors! Don't forget to register for the Senior College Boot Camp. Details and sign up below and on the College Counseling page. Join Us for Move-In Day on Sunday, August 21! Please join us for SEED Maryland's move-in day! Details are below; please click the image below or this link to RSVP. We are very grateful for any and all volunteers (age 17 or older) during this fun and meaningful day! SEED Maryland's Second Commencement Ceremony! Congratulations to the Class of 2020 for graduating this past Saturday! As we celebrate SEED MD’s second graduating class, we look forward to supporting the next group of intelligent and accomplished young adults as they make their way into the next phase of their lives--college! Thank you again to all of those who attended this incredible event, and to our commencement speaker, Kieffer Jackson Mitchell Jr., who delivered an inspiring speech to SEED Maryland’s newest graduates. View the entire album on The SEED Foundation's Flickr page.